Last Thursday, my brother and I went to see the light show that was being held in Hull City. Besides being the home of the world famous Hull City football club, we’d also recently learnt that the city had won the prestigious City of Culture Award for the year of 2017, so we were pretty excited to take a quick trip out of town for the show. As we got closer we were met with loads of traffic snaking up all the way to Hull City. My brother and I had started the trip pretty late, at around 5 pm, so when we finally got close to the entrance of the city, and the traffic wasn’t showing any signs of letting up, we decided to just park up and walk down. We parked the car at the Hull train station and went the rest of the way on foot. Thankfully, it turned out to be the fastest option. 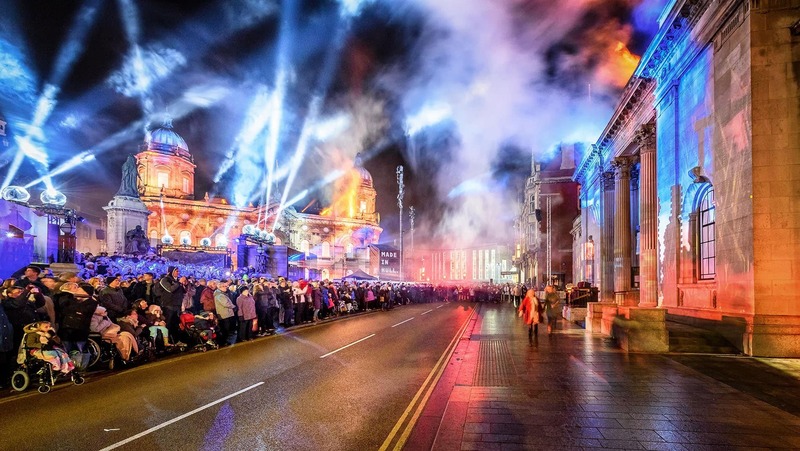 We were met by a city alive with lights, music and a large banner proudly announcing “Hull City, City Of Culture 2017″. That night, there was such a buzz with the excitement of thousands of people anxiously awaiting the show. The show was meant to be ten minutes long, so before it began, my brother and I tried to work out the best position from which to photograph. It wasn’t an easy task with so many people teeming around, but we finally managed to find a lovely spot. This is what we got once the show began. The show consisted of a spectacular firework display down by the Humber Waterfront, where thousands huddled for the enchanting experience. The buildings of the city were also lit up bright with stories of the city’s history and recent victories, whilst the streets themselves were a sight of celebration with music streaming loud from the sound systems. There were dancing, laughter by everyone in attendance. At some point in the evening, we worked our way to the other side of Queen Victoria Square to photograph the largest building. 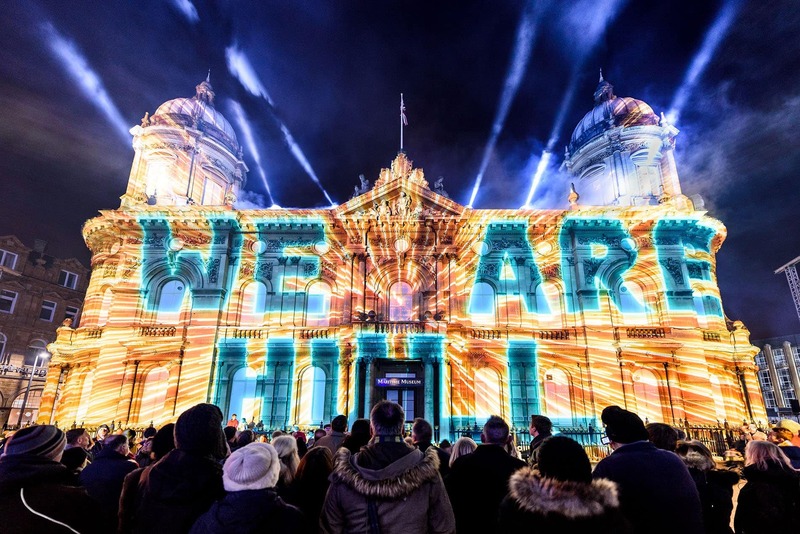 It was a historical structure that in lieu of the celebrations had been lit up with the large glorious words ” We Are Hull”. At first, we were quite worried that a decent photograph would be impossible with the density of the moving crowd. However, I did manage to photograph the flaming words that lit up high during the light show. The final shot after editing is below. All in all, it was an amazing night that I would gladly revisit if it happens again. Hull City, true to its name as the city of culture, is indeed a city steeped in beauty and liveliness. I am absolutely honoured to have been a part of it and to have had the opportunity to share this with you. I hope you enjoyed it as well. Did you go to this event in Hull?